After the wedding* Shawn and I kept talking about how we wanted to put our wedding in a jar and keep it. Obviously, we couldn’t put the food, the cake and all the guests and everything in a jar, that’s crazy. 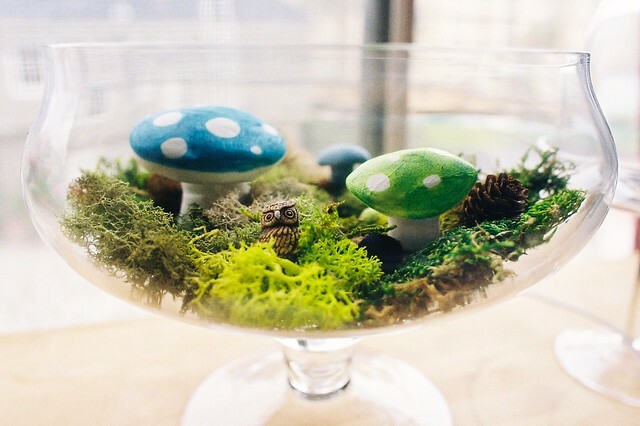 We could on the other hand, take some of the decorations from our rehearsal party and a few from the wedding and make terrariums. Shawn picked out these fantastic glass canisters from Pottery Barn and we each made our own. 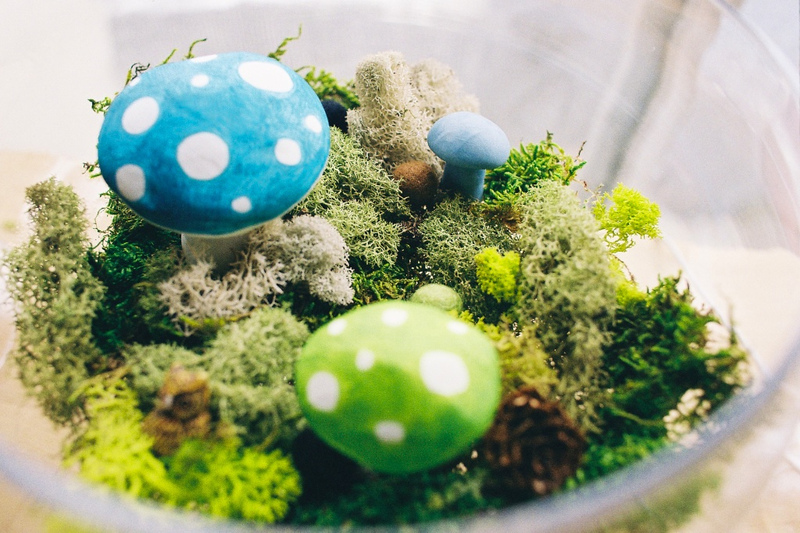 He made his extra cute by painting each mushroom with red and white dots. Of course they made the mushrooms that much cuter so I had to copy him. 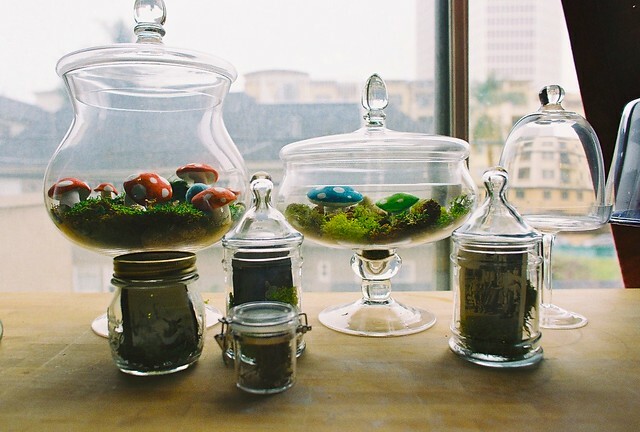 We filled them with different mosses and little bits and bobs. They look lovely with some of my cake stands and a few of the elements from our centerpieces, made by Suki from Happening for our wedding. Other exciting news, in case you don’t follow me on twitter, WE’RE MOVING! I couldn’t be more ecstatic. We get the keys to our new apartment this Friday. We’ve been in desperate need of more space for quite some time now and this new place is just what we’ve been looking for. I can’t wait to have some room to breath and the chance to redecorate our home from scratch. *I know what you’re thinking, I’m still talking about the wedding, over a month later, and I haven’t even shown you any photos. What a jerk! I hope I’m not annoying the heck out of you all, but it was kind of a big deal, you know? There will be photos, I promise. What a beautiful idea – I love it. And will probably steal it if I get married one day. But I’m dying to know – where did you get the tiny cake stand on the far right, the one with the top? It’s adorable and just what I’ve been wanting! it is also from Pottery Barn. it is cupcake sized. i can’t wait to use it. Oh my goodness, this is SO perfect! My question is, where did you find the moss? 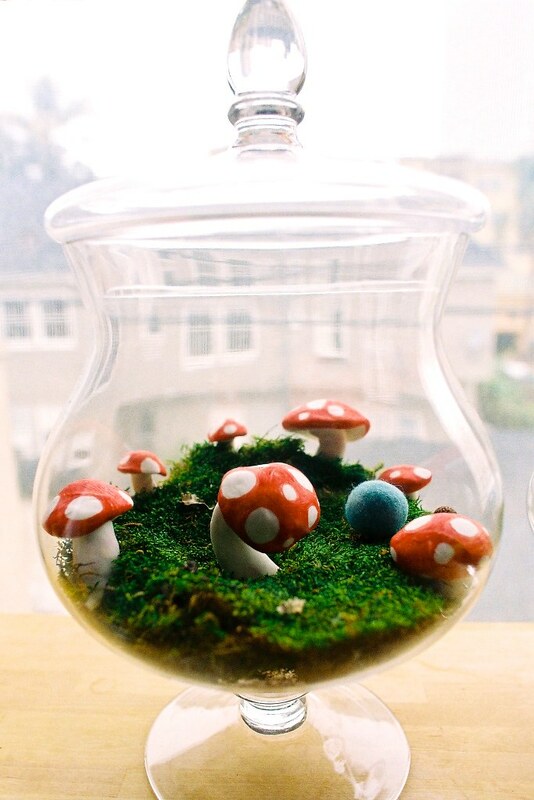 A lovely friend got some jars for me for my birthday and I can’t find any moss around here! I’m wondering if I just have to drive until I find some or maybe a crafting store has fake stuff. since the moss was all leftover decorations i’m not exactly sure where it all came from. some from it was bought at a local florist supply place and i’m pretty sure the rest was ordered online (amazon even has Feather Moss ). i think target also has some fake stuff. Oh my god, Alix. Ridiculously, adorably, cute. And I think I speak for many guests when I say we wouldn’t have minded being in a jar of that wedding forever after.